When I first read this quote by Nassim Taleb I couldn’t help but wince. Yes, it is a sweeping generalisation (the definition of an aphorism is “a pithy observation which contains a general truth”) and doesn’t represent most of the consultants with whom we work. Yet, for others, the quote will be a little too close to home. Taleb’s quote is a neat and slightly contentious example of how ‘Procrustean solutions’ may impact the world of consulting. In this Point of View article we examine Procrustean solutions in more detail and how they might negatively affect two key aspects of a consultant’s work – problem-solving and business development. We conclude by suggesting ways that firms can ensure they are not affected by the scourge of the Procrustean solution. According to Greek mythology, Procrustes was the macabre owner of an inn on the road between Athens and Eleusis. He was well known for creating the famous ‘Procrustean Bed’ that would perfectly fit anyone who lay on it. Procrustes would wait on the road for weary travellers and extend to them the invitation of a nice warm meal in his inn followed by a sleep in his ‘special’ bed. Regrettably for the travellers, Procrustes’ sense of hospitality was not all it seemed: the bed didn’t resize to fit the traveller, the traveller resized to fit the bed. Because Procrustes wanted the bed to fit his guests perfectly, those who were too tall had their legs chopped down to size and those who were too short were stretched. TripAdvisor would have had a field day. Procrustes, however, hadn’t accounted for Theseus, the King and Founder of Athens. When Theseus heard the rumours about the ghoulish innkeeper, he made his way to the inn disguised as a traveller and after the customary meal, was shown to his room and invited by Procrustes to climb into the famous bed. But Theseus was prepared… Just as he was about to climb into the bed, he removed his disguise, revealing his true identity, and most likely shouted in Greek: “Not so fast Procrustes!” [Editor’s Licence] before overpowering his shocked host and forcing him onto his own bed. ‘Hoist by my own petard!” were likely Procrustes’ final words [Editor’s Licence] as he discovered that he was unfortunately a bit too tall for his own bed and that Theseus could also make anybody fit. In Procrustes’ case by removing excess height – from the neck upwards. Theseus would go on to have a stellar career, famous for many daring feats of heroism including outwitting and dispatching the Minotaur. Likewise, Procrustes’ reputation was assured as the man that gave the world the ‘Procrustean Solution’. A Procrustean Solution occurs when a client is made to fit a pre-determined solution rather than the solution being specifically tailored to fit the client. Using the Greek myth example, the traveller (client) is made to fit the bed (solution), not the bed to fit the traveller. Within consulting we have identified two main areas where Procrustean solutions are most likely to be found: the analytical problem-solving process (the bedrock of strategic consultancy projects) and the business development process. In the analytical problem-solving process, a Procrustean solution occurs when the consultant has pre-determined the conclusions and recommendations he will offer the client before even embarking on any data gathering exercise. Even when data has been collected, the consultant simply ignores the data that doesn’t match her pre-determined conclusions and instead chooses to only acknowledge the findings that fit the pre-determined solution she had planned to recommend. In summary, the data is made to fit the hypotheses. In business development, a Procrustean solution appears when a consultant goes to a meeting with a prospective client having decided in advance what point of view they will propose, regardless of what may arise in the client conversation. Perhaps worse still, the consultant may already know the final solution they want to implement and force the prospect’s reality to fit their pre-determined theories, ideas or beliefs whatever their situation. Occasionally a consultant may get lucky and find that the pre-determined solution fits the client perfectly. Often, however, a procrustean solution will only have negative consequences for the client/consultant relationship. Using the business development example, offering a pre-determined point of view or opinion despite hearing additional information will doubtless lead the prospect to think you have not listened to them, you have wasted their time, you have not framed their current situation and you have treated them just the same as everyone else. What’s more, clients know when they are simply being offered something ‘off the shelf’ with little forethought for their actual situation. By offering a pre-conceived idea, the consultant either appears lazy, arrogant or uninterested. In the analytical problem solving example, making the data fit the hypotheses to justify pre-conceived recommendations is most unlikely to solve the client’s problems. By suggesting a client accepts a solution that doesn’t match their reality, there will likely be less enthusiasm on the client’s part to try and make the project work. Should the project eventually fail or overruns, the client will be quick to blame the consultant and conclude she has pursued her own interests at their expense. Positions of blame, distrust, doubt and dishonesty are never the foundations for a loyal, mutually beneficial and long-term client relationship! How do consultants avoid the scourge of Procrustean solutions? In business development, the best performing consultants make it a priority in any meeting to listen, understand and frame the client’s situation, reality, problems and beliefs and adapt their views accordingly. Sales meetings are a dialogue, client reservations are part of the solution and negotiation is collaborative. To avoid a Procrustean solution in a business development scenario, consultants should ask many questions to determine: who are the key stakeholders, what are the organisational objectives, what is the overriding culture of the client’s organisation and are there any internal politics that need to be considered? Only once this essential scoping has been carried out and the consultant has a clear idea of the client’s context can she offer a point of view, or potential solution, that matches the client’s situation. The client scoping phase is equally as crucial in the analytical problem solving process. In a hypothesis-based approach, this means that your data collection and subsequent analyses seek out to test, not prove your hypotheses (theories). Only by being true to what you find – and not what you thought you would, or wanted to, find – will you ensure that the recommendations you offer are tailored to the client’s situation and not that the client’s situation is forced to fit your pre-determined solutions. Consultants – Procrustes or Theseus? 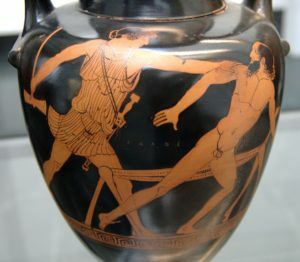 As a consultant, you need to consciously decide whether you are Procrustes or Theseus. Do you put your clients in a ‘special’ bed of preconceived ideas and solutions, resizing them to fit your agenda, or are you Theseus, on your guard for Procrustean situations and despatching any manifestation you discover on your travels? Do you start with a problem and create a solution, or do you start with a ‘solution’ and find a problem that fits? Affronted, you may have already decided what your answer is. Then again, if you have already decided your answer and haven’t given any additional thought to your actual situation, who’s being Procrustean now? Our structured analytical thinking programme enables consultants to increase the power and effectiveness of their thinking and apply a consistent consultative approach to solve unstructured and ambiguous business problems and generate new, creative opportunities.